This version contains corrected links. Living green isn’t always easy and living green with a growing family can be even more of a challenge. Every parent faces a unique journey. Hearing about other parents’ experiences, however, can offer great insight on how to be a green parent in the modern world. In this edition of Living Green 365, two MPCA employees--Emily Barker, an Organics and Recycling Specialist and an expectant mother, and Amanda Cotton, a Waste & Toxic Pollution Prevention Specialist and a mother of two children under 3--share how their desire to be green has impacted their choices. Making green choices can be difficult with so many environmental concerns -- toxic chemicals, carbon footprint, waste, or water usage--to consider. Decide what is most important to your family. For Amanda, getting an eco-friendly crib mattress was important because “it’s one of those things that your baby will use all the time.” She added: "My husband and I visited a local baby store and found (chemical-free) mattresses to be a lot of money.” Despite the price, they purchased one out of concern for the baby's health. According to a 2014 University of Texas Austin study, new crib mattresses release about four times as many volatile organic chemicals (VOCs) as old mattresses. The study also found that chemical emissions are strongest in a sleeping baby's immediate breathing zone. Emily spoke about the importance of reducing waste. For baby food, “I’d rather have something from a glass jar [that can be reused or easily recycled] than something that's more difficult to recycle” like pouch-based baby foods. Food pouches are lighter and likely use less fuel to transport but are made of materials that are not easily recyclable. Can green parenting be practical? Sometimes, the eco-friendly choice happens to be a frugal one. Amanda recommends the Chinook Book, a coupon book that focuses on sustainable living, as a money saver for green products and services. Buying (or being gifted) used items can also be an economical and environment-friendly way to reduce consumption and waste. With the Internet, doctors, and friends and family with children, there are many, sometimes conflicting, messages that can make even the most confident parents question whether they're making the right choices. “Becoming a new parent produces enough anxiety as it is”, noted Emily. "Having a healthy level of knowledge without letting it become a stress factor is important. Every parent must make the choices that work best for their family. By taking the time to learn about green options, and incorporating what you can, your family and the planet will be better off for years to come." Babies are sometimes referred to as stuff-magnets. New products guaranteed to simplify the lives of parents and improve the lives of babies regularly show up in ads and on store shelves. 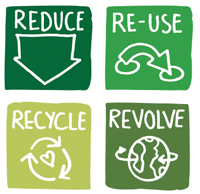 With so many new products and gadgets, it can be difficult to keep the 3 Rs –reduce, reuse, recycle– in mind. Learning to take a more minimalist approach can save parents money and space. Out of liability and safety concerns, items like car seats should typically be purchased new. However, items like baby clothing are prime candidates for reuse. • Encourage friends and family members to share their used baby items and clothing. Or, organize a neighborhood swap with other parents of small children. • Shop thrift stores, yard sales and consignment stores. Many communities and organizations, such as Early Childhood Family Education in St. Louis Park, also offer periodic consignment sales. • Check-out online consignment sites, such as swap.com, thredUP, and EBay. • Peapods in St. Paul offers gently-used cloth diaper packages for sale. 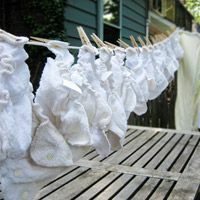 There are also a number of reusable diaper delivery and pick-up services in the Twin Cities and other Minnesota communities. • Minneapolis Toy Library, a new mobile toy-lending venture, is launching in May. With any used product, it's important to check for existing safety recalls or hazards. The U.S. Consumer Products Safety Commission is the go-to site for product recall information. You can also download product safety reports at SaferProducts.gov. • Concerned about what paint or products to use, or what to avoid, in the nursery? The U.S. Green Building Council’s Green Home Guide provides some valuable guidance on things to consider if remodeling or building a nursery in Creating a Safe, Healthy Room for Your Child. • A variety of environmental product certifications and labels exist, some more reliable and trustworthy than others. Consumer Reports’ Eco-Label App for iPhone and iPad users is one tool for determining what’s legitimate and what’s not. There’s also an online version. • Do it Green! 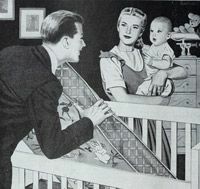 Minnesota offers several thought-provoking articles on raising eco-conscious babies and children: http://www.doitgreen.org/green-living/family. The Minnesota Pollution Control Agency (MPCA) is now accepting applications from individuals interested in AmeriCorps service with Minnesota GreenCorps during the 2015-2016 program year. Minnesota GreenCorps is an AmeriCorps program, coordinated by the MPCA, which places AmeriCorps members with organizations around the state to spend 11 months addressing environmental issues and building community resilience. More information on the program is available here. Completed member applications, along with a resume, must be submitted to mgcapplication.pca@state.mn.us by the deadline of June 12, 2015. NOTE: Applications from organizations interested in participating as host sites for the 2015-2016 program year are being accepted until 5:00 PM CDT on Monday, May 4, 2015. Host site application packets, including a detailed guidance document and the application, are only available by emailing your request to mngreencorps.pca@state.mn.us. Please direct all questions to this email address. National Bike to School Day was started in 2012 in response to the popular National Walk to School Day, which occurs in October. The event celebrates safe and efficient biking to and from school. For 2015, the National Bike to School Day has been set for May 6, 2015. For a list of participating communities, schools, and events in Minnesota, see Bike to School MN. ArtStart's EcoArts Fest, now in its eighth year, is a one-day, outdoor arts, environmental and cultural celebration. A free, family-friendly event, the EcoArts Fest is first and foremost a celebration honoring our ties to one another and to Mother Earth. Overall, the EcoArts Fest focuses on delivering engaging activities and experiences that provide knowledge about an environmental issue through art making and demonstrate ways individuals can take positive actions to make change. At the MRES' Solar Boat Regatta, teams demonstrate knowledge of science, technology, engineering and math (STEM) to design and build boats powered by the sun. They compete in a number of races, culminating with a one-hour endurance race. A solar boat makes use of the sun's radiation. The solar energy must be received exclusively by on-board transducers (photovoltaic cells). On-board storage and conversion into intermediate forms of energy (electric energy storage in batteries) are permitted. The boats must not be designed to use forms of energy other than solar - no wind, no human power, no gas engine power, no additional batteries, and no additional PV cells. WaterFest is a free celebration of our clean lakes and offers outdoor fun and opportunities for hands-on learning about the water quality, wildlife, and special ecological features of the RWMWD. WaterFest was created in 2000 and remains an annual fun family event! Thank you for reading Living Green 365. This edition of the newsletter was written by Erin Barnes-Driscoll and Alexandra Ullberg. This newsletter is a publication of the Minnesota Pollution Control Agency. Please send questions or comments about living green to the address below.